Our skilled nursing team brings contemporary, in-depth knowledge to our Skilled Nursing Services group—a 24-hour team of licensed professionals whose goal is to provide the best possible care to all our rehabilitation patients and long term care residents. Our team covers a broad range of sustaining medical care, including wound dressings, rehabilitation, tube feedings, intravenous treatments and more. 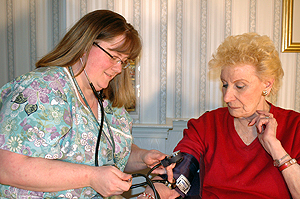 Sometimes residents exhibit a health status that suddenly begins to change quickly; trained, licensed professionals must be on staff and at-the-ready to address situations which may escalate to hospitalization—certified nursing professionals who can recognize the problem and sometimes provide safe and effective remediation without hospitalization. 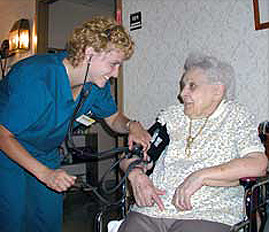 The daily routine of a professional skilled nurse at Bear Hill requires much more than a nursing degree. It calls for compassion toward every resident, and recognition of the importance of providing the best in quality care for others. Our nursing staff’s credentials go far beyond their medical certifications: They are genuine, caring individuals who show their commitment with warmth and a measure of hospitality. The bottom line is quality care. Providing that level of excellence for each patient or resident does not come without rigorous control over monitoring, medication dosage, and approved diet. Every nursing station in our facility is ready 24 hours a day to react to any situation, whether an emergency, a request for a glass of water, or anything in between. Many rehabilitation patients, residents and their families attest to Bear Hill’s remarkable affinity for providing care in a “comforting” way. It is a skill we look for in any health care professional who is a candidate to join our staff. We’re proud of the very long tenures of our medical professionals, and it is the seasoned experience of these employees who help us maintain that “comfort level” as we heal our rehab patients and sustain an optimum quality of life for our long term residents. the staff at Bear Hill warmly welcomes you. Black Pike Software Services, and SquareSpace™. Quality care from dedicated healthcare professionals in an attractive, comfortable, natural environment.